"Hoşgeldiniz" Istanbul is waiting to welcome you. Historically known as Constantinople, Istanbul is the cultural, economic, and financial centre of Turkey. It is the only city in the world that extends into two continents. New President Holidays now offer 3 to 6 nights Istanbul city breaks, longer duration (7 to 21 nights) Istanbul holidays, Istanbul flights and Istanbul hotels. A visit to Sultan Ahmet centre in the heart of the old city would be a good place to start exploring Istanbul. There are many Istanbul hotels in and around Sultan Ahmet and you will find palaces, places of religion, unique shopping trips among many other experiences which can be reached from here easily. Hotels in Sirkeci are very close to the Sultan Ahmet centre and you will find good selection of them featured on our website. You can now book your Istanbul holiday online securely with New President Holidays. 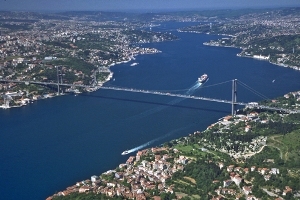 All Istanbul city breaks and Istanbul package holidays featured include; accommodation, return flights and transfers. Blue Mosque, Hagia Sophia, Topkapi Palace, Galata Bridge and Galata Tower are to name some of ISTANBUL’s most popular attractions. If you have your flights already arranged, you can find selection of ISTANBUL hotels available on our website. Whether you are visiting ISTANBUL for business or pleasure, you will find selection of hotels to suit your requirements and you can book your hotel online securely NOW. North Cyprus is approximately six hours away from UK airports including a short stop, approximately of 45 minutes en route in Turkey. Main airport in North Cyprus is Ercan Airport, located short drive from the capital Nicosia. Kyrenia and Famagusta holiday resorts are only short drive from the Ercan Airport. You can book your North Cyprus flights arriving to Ercan Airport securely online with New President Holidays and enjoy exclusive offers as well as good value flights. FREE 7 nights Self Catering accommodation (from the day of arrival) staying in Rose Gardens holiday village in Kyrenia is included when you book return flights to North Cyprus online. Also FREE 20kg luggage allowance as well as 8kg hand luggage with all return flights to North Cyprus. Addition to North Cyprus flights you can also book cheap Istanbul flights online to Sabiha Gokcen Airport in Istanbul-Turkey with New President Holidays. Connections to local airports in Turkey can be arranged on request.